If you scroll through the articles on our website, you’ll see that there are many village reviews. Why is that? Well, the reason is simple: they all have something unique to offer to the tourists, especially the ones that come from the Western Civilization. The locals aren’t really big fans of changes and prefer to stick with the old traditions, customs, and way of living. For example, the people of Beleke are great at crafting various items from rattan. They’ve been doing this for many generations, passing down the knowledge to the youngsters. The craftsmen of this village have a lot of respect in the community, as they provide for their families doing honest work. And we are all free to give them a visit. The Beleke village is always open to the foreigners. Watching these people sharpen their skills is priceless! Lombok is famous for its unique and diverse villages. The Sasak people, the indigenous population of the island, are always smiling and thanking their gods for providing food and shelter. Living in the “Wild West”, we constantly forget to be thankful, and visits like this one are important to help us wake up and appreciate the gifts from the Almighty. I had a lovely time in Beleke and encourage you all to give it a chance. Lombok is not all about the fancy beaches and ancient temples – these tiny settlements carry the real value. I have to say that even after you follow the instructions on how to find this place at the bottom of this article, it might still be a bit tricky to locate the village. The thing is – the gate with the official sign is “hidden” behind the tree twigs. So, make sure you slow down a bit when you get closer to the destination and sharpen your eyes and ears. One could say that this means Beleke is one of the least popular tourist spots on the island, and they would be absolutely right. In contrast to the folks in the other communities, they don’t really care whether the foreigners visit their village or not. The only thing they do care about is their work. The locals handle rattan like they were born to do that! I feel like I need to tell you more about rattan, as some folks confuse it with wicker. Here goes: rattan is a material, the one these people use to handcraft stuff like baskets, whereas wicker refers to the style, or, rather, technique of weaving. The craftsmen don’t even have to leave home to get it. The rattan plants grow all over the village and look like bamboo. My advice to you: follow the trail of cut rattan – soon, you’ll get to the village. It’s not that big and the locals live modest lives. At the same time, it’s very colorful and you’ll instantly know that you arrived at the right place once you see the masters working on their latest “product”. Obviously, this is not the only village that knows how to work with rattan. In fact, this is one of the most popular and important crafts in Lombok. But I wanted to tell you about the Beleke village because it’s one of the handicraft centers on the island. They provide this material to Bali and make a living on it. The price ranges from 3K to 6K IDR, and the locals make quite a nice profit from it. When I first arrived there, I was amazed by the sleight of hands of the ladies working on twisted rattan. You are more than welcome to try it out by yourself, but please keep in mind that without some proper skills, you’ll end up ruining it all instead of creating something solid. Bali is not the only buyer: collectors are always interested in getting something cheap and selling it to a third party. Say, the art shops owners are very happy to pay an extra dollar for the high-quality materials. Furthermore, countries all over the world, including the US, Japan, Singapore, and others, are also among the regular buyers. Now, it’s worth mentioning that this craft demands years of tries and failures before you can master it. Plus, the process of making something from rattan requires a lot of time and focus. The Beleke village offers a wide range of handcrafted items that you can purchase for just a couple of dollars and bring back home as presents. Do you think that the Beleke village is just another boring spot in Lombok? I dare you to visit the place and see it all for yourself. It would be best to do that after you have enough of the beaches and temples. That’s when a unique settlement like this one will be best to experience. Oh, and do grab your camera and/or high-quality phone to take some awesome pictures. Just take a look at the ones I put in the beginning of this article: doesn’t the place look absolutely lovely? And while this might not be a resort town or anything like that, you will have a wonderful time exploring the village and the craftsmen. At the end of the day, that’s what’s important on a trip. If you need comfort, rent a nice guest house/hotel room, have a delicious meal at one of the local restaurants and get a tan at one of the gorgeous beaches (read about them on our website). But, at the end of the trip, hop in your rented vehicle and travel to the Beleke village. Remember: you’ll find baskets on every step of the way in Lombok, especially in Mataram. They are cheap, but the quality is so-so. If you want the real deal, places like Beleke are the best bet. Usually, the masters provide the best balance between quality and price. I bought a couple of baskets and they still look like I got them yesterday (even though it’s been a while). The best part about the process of making complicated items in Beleke is that it usually involves several families. The first one gathers the material and colors it. The second one works tirelessly to create the baskets. And then there’s the third family that takes care of carving various figures in wood. The fellas handle the cutting: they make sure the end of the rattan is nice and sharp. Then, a tiny awl is required to pierce a coil of the basket and put the fiber through. This stage is very time-consuming and you’ll need a lot of patience and super-strong fingers to do everything right. Personally, I tried it and got tired after a couple of “runs” in the Beleke village. Speaking of the carved out images, the variety is large. Say, a lizard or any kind of fish represents fertility. The rooster, in turn, symbolizes new beginnings and new gifts. Keep in mind, though, that some of these figures are 18+ and come with naughty engravings and sexual images. The animals are usually a combination of two or more beasts; same goes for the human beings. The best masters are capable of carving out something beautiful and complex (like an elephant or a hippo) in less than an hour. The sizes and the shapes of the baskets vary depending on the wishes of the potential buyers. Ok, last, but not least, let’s check out the best routes and means of transportation to get to the Beleke village. From Mataram, the major city, the ride will take no more than 25 minutes. The road is 12-13 kilometers long. From the Lombok Airport, the distance is also quite short: a taxi driver will take you there within 30 minutes (23 kilometers). However, if the traffic is bad, you’ll have to take a detour, and the ride will take up to 45 minutes. It all depends on your luck, I guess. Now, even though Beleke is not the most advanced and developed village on the island, there are enough shopping malls, restaurants, and “official” buildings in the area. Central Lombok is +/- 15 kilometers away, which means the locals have instant access to civilization. In my opinion, this is the best combination: I’m talking about a secluded, almost uncharted place that offers the comfort and tranquility of a quiet village while being right at the center of it all. As always, I highly recommend renting a car or motorbike if you’re planning on staying for long. But if the trip is only 1-2 days long, then a personal driver might be the better choice. Public transportation is way cheaper; yet, it will turn your adventure in Lombok into quite an unpleasing endeavor. So, spend those bucks like a boss! Some people could say that this village is boring. Others could claim that there is nothing special about it. But to me, it's unique and lovely. Lombok is a special place. I've been to almost every single village there and they are still as thrilling and exciting as years ago! The Beleke village is not an exception. I wouldn't say Beleke is at the heart of Lombok, but insisting that it's lost in the middle of nowhere is wrong. Perfect for a visit on a sunny day. 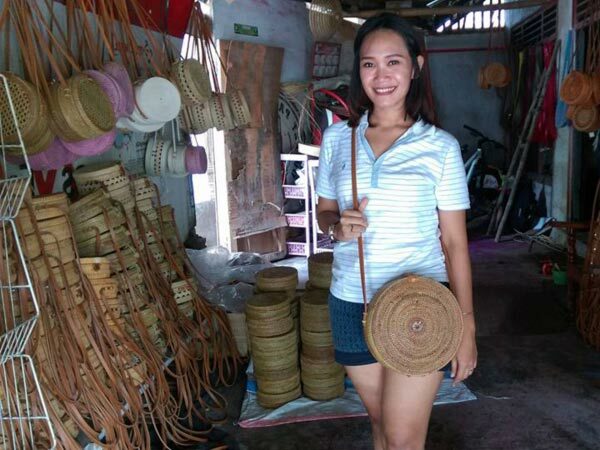 Even though the locals are surprisingly friendly, they are all busy crafting baskets and other stuff from rattan. So, don't go sticking your nose into their business. I had absolutely no problem detecting the gates that lead into Beleke. Besides, all that noise will grab your attention from a mile away.